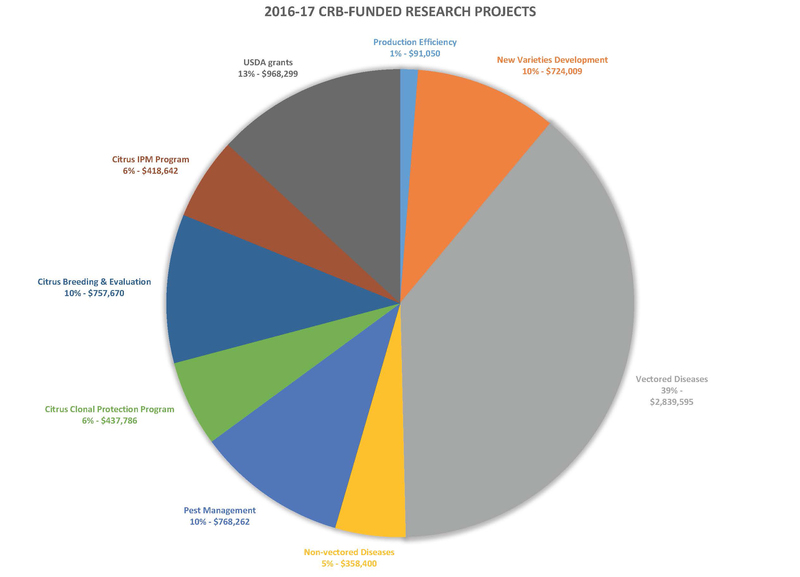 The California Citrus Research Board (CRB) has approved funding of research projects for the 2016-17 fiscal year. (Table 1): Click charts to view larger format. 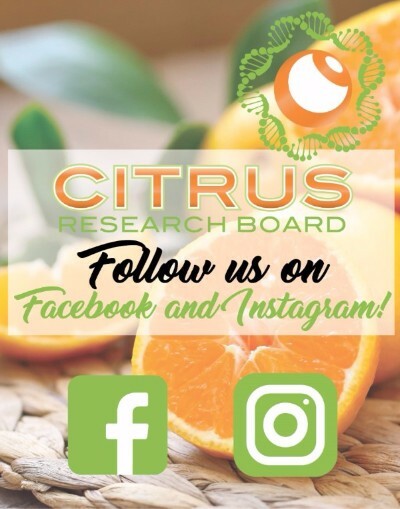 The Citrus Research Board (CRB) has released the final report of the HLB External Review, conducted at University of California, Davis on September 6-9, 2016. This report is for use in making future research funding decisions, closing research gaps, encouraging closer collaboration and other purposes as identified in the report. 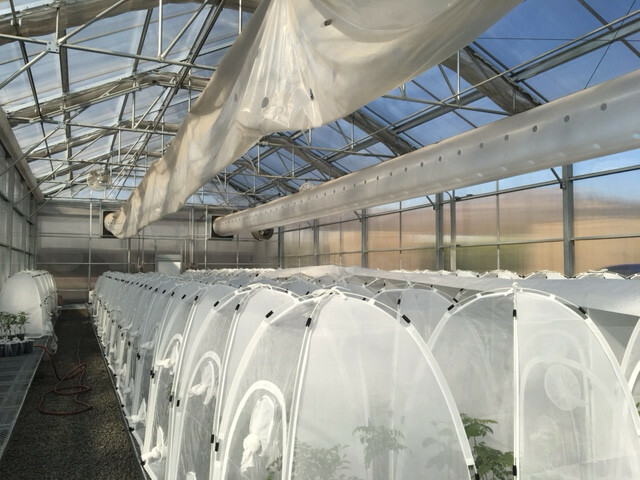 California ACP biocontrol efforts have broken a record this year. In 2016, a record 604,000 Tamarixia were produced in field cages by the CRB, close to 33% of the total produced by the program this year. (Table 1) shows data from the field cage program and the total Tamarixia produced by all program partners. Photo courtesy of Greg Simmons, Ph.D. The public is invited to a Soils Summit hosted by the USDA Natural Resources Conservation Service (NRCS) and the California Department of Food and Agriculture (CDFA) on healthy soil and climate smart agriculture. The meeting provides an opportunity to explore roles and collaborative opportunities for managing California soils for health and natural fertility while reducing greenhouse gases. The meeting will be held at the CDFA Auditorium, 1220 N St., Sacramento, on Jan. 11, 2017 from 9:30 a.m. until 4:30 p.m.
A link to the agenda for soil summit may be found by clicking here. To read the full USDA press release click here. Click Here to view all Committee Appointments. 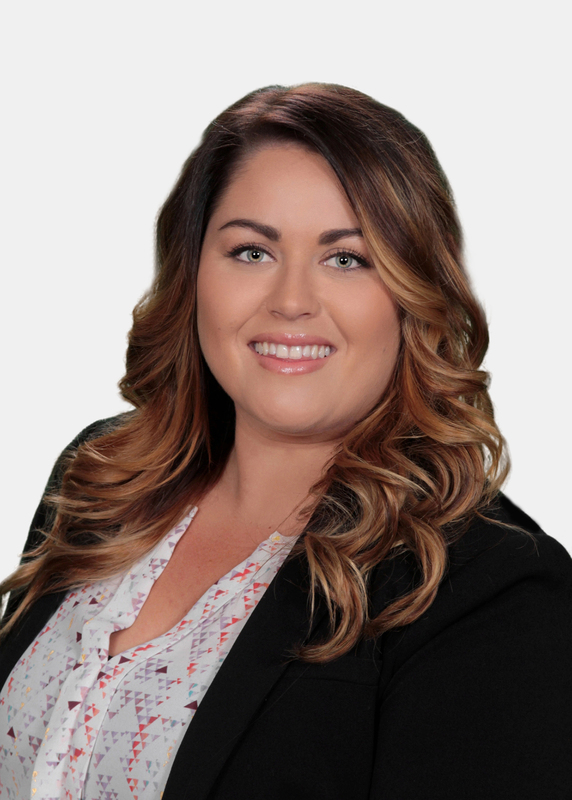 Carolina Evangelo joined our staff as the director of communications on August 19 after serving several years as a member of the Citrograph editorial, production and advertising sales team. For the past seven years, she was owner-operator of Carolina Evangelo Communications. 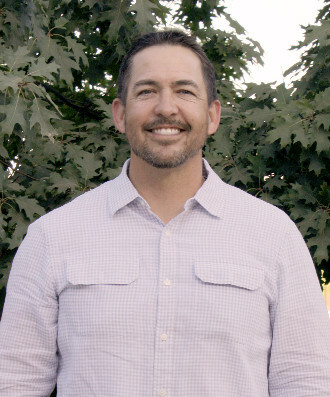 Evangelo holds a Bachelor of Science degree in Dairy Science from California Polytechnic State University, San Luis Obispo. 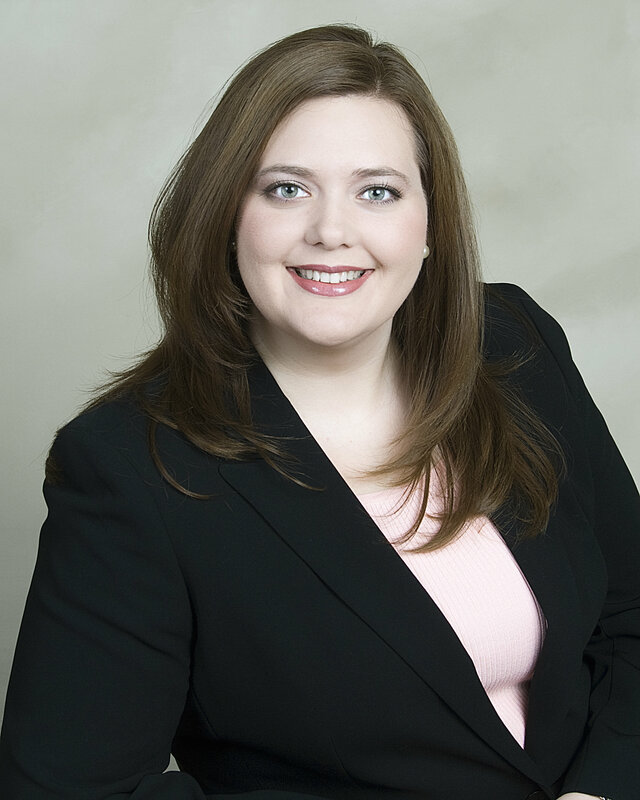 Tamara Tollison is the administrative assistant for the Communications Department and for Human Resources. She began working at the CRB on August 29. 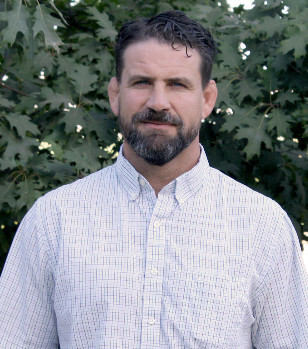 Tollison earned a Bachelor of Science degree in Agricultural Communications from Texas Tech University. 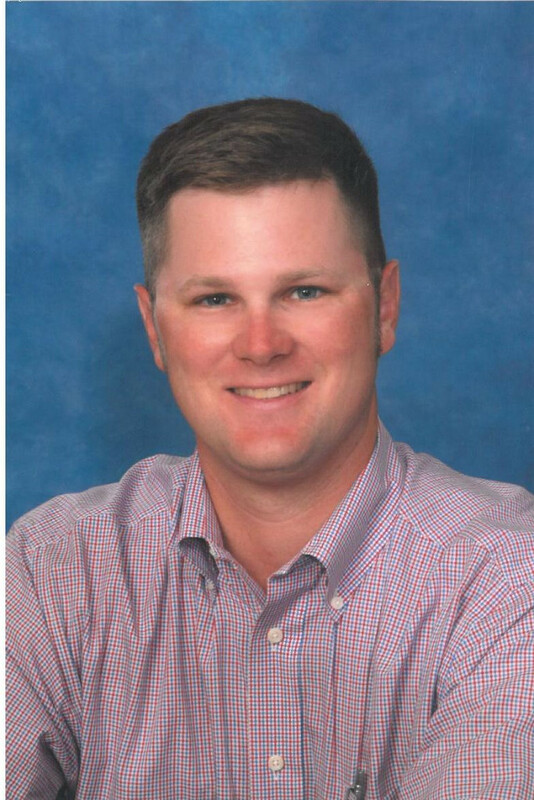 Matt Stuemky began his career at the CRB on June 27 as GIS analyst. 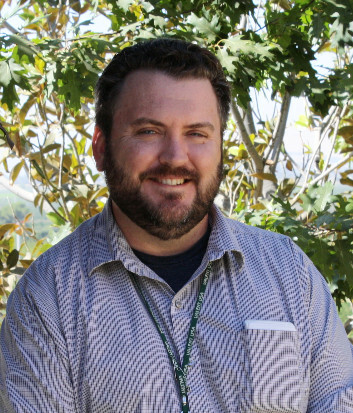 His prior employment was with the Pacific Southwest Research Station, a research and development division of the U.S. Forest Service, and with the University of California-Merced. 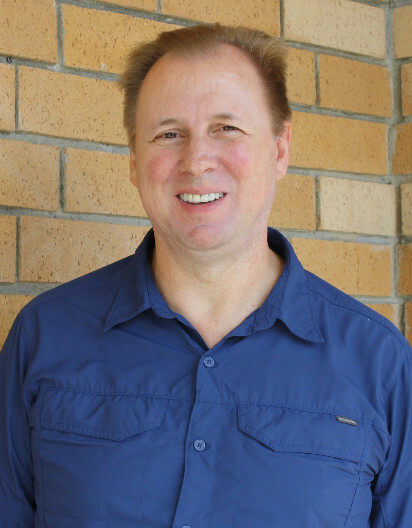 Stuemky holds a Graduate Certificate from the University of Southern California in Geographic Information Science and Technology. Get connected and stay informed. Follow us on our NEW Facebook and Instagram! Whether you are a grower, packer or other industry stakeholder, we all want the same thing: to avoid the citrus industry devastation caused by Huanglongbing as we’ve seen in Florida. Please take a few minutes to complete a survey developed by California Citrus Mutual and the Citrus Pest & Disease Prevention Program to help identify priority strategies moving forward to combat the deadly tree disease. Click here to take the survey. The Citrus Pest & Disease Prevention Program is warning residents about a devastating plant disease found in California called Huanglongbing. Also known as HLB or citrus greening, the disease kills all citrus varieties, including orange, lemon, mandarin, kumquat and other citrus trees. We must work together to prevent the disease from spreading. 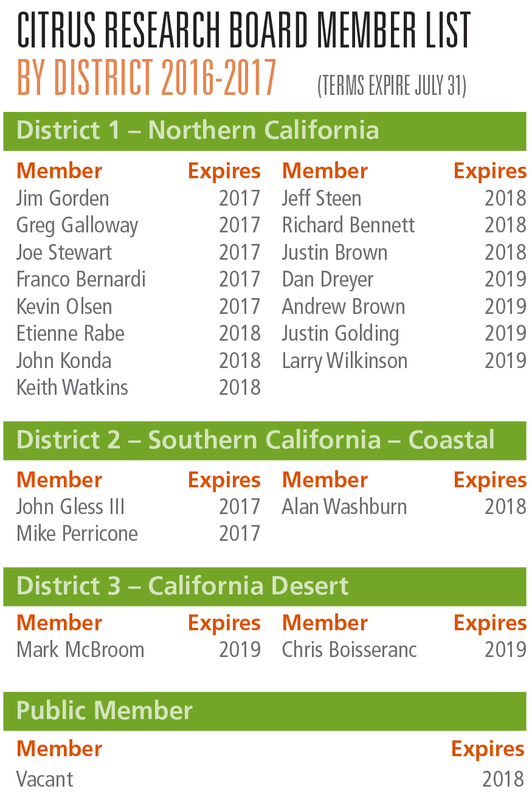 Learn how you can help and take the pledge to save California citrus: http://CaliforniaCitrusThreat.org/Pledge. 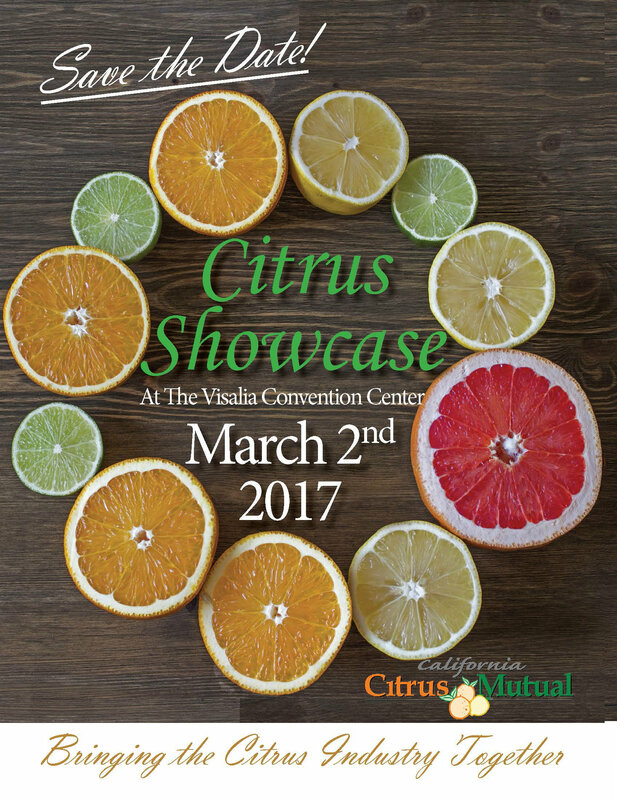 Those who take the pledge are entered to win a bag of fresh citrus fruit supplied by a California citrus farmer. Take the pledge and be entered to win. 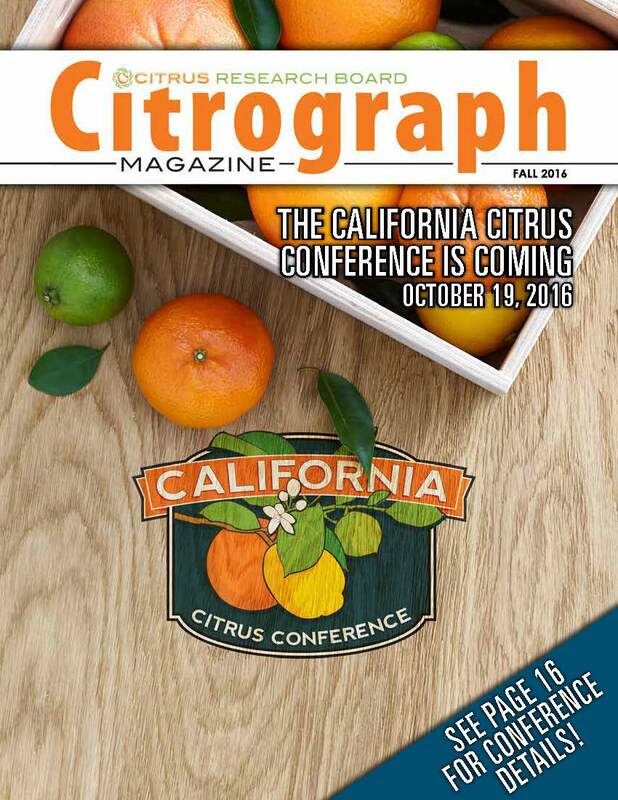 The California citrus industry is building a Bio-Security Level 3 facility adjacent to the University of California, Riverside campus for the expressed purpose of finding a cure for Huanglongbing. This $8 million facility will be owned by the industry and foster an even closer partnership with our University system. The California Citrus Research Foundation is looking for a talented individual to serve as the Executive Director of the new facility. CCM President Joel Nelsen currently serves as interim executive director to the nine-member Board of Trustees representing the industry. If you are interested in applying, or know someone that might be a great fit for this position, please contact Joel Nelsen at jnelsen@cacitrusmutual.com. Interviews will begin in the latter part of January. up-to-date news from the CRB and industry partners. 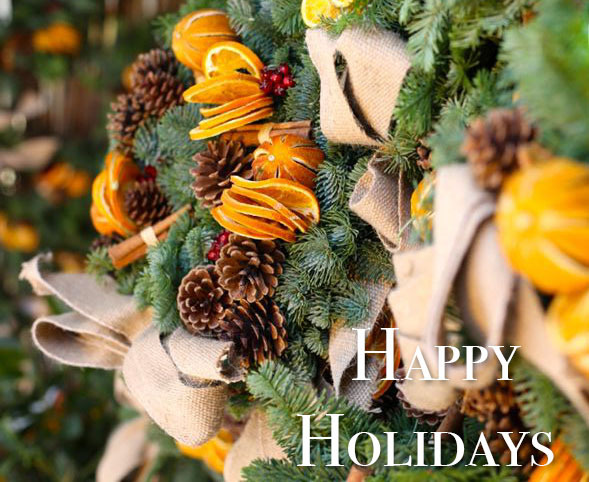 We wish you and your families a joyous holiday season! 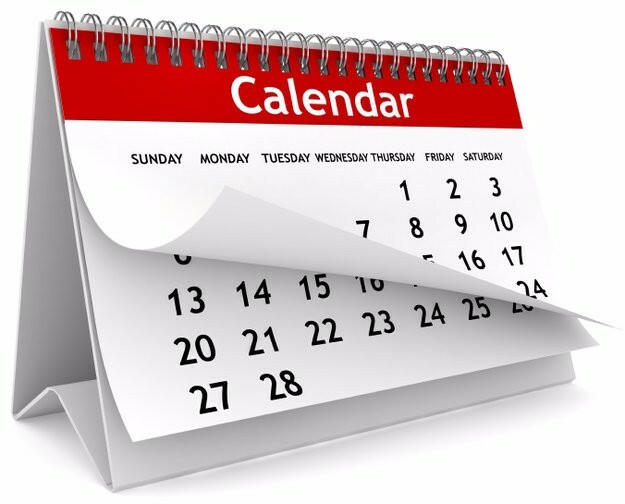 Click here to view the most updated Full CRB annual calendar. Copyright © 2016 Citrus Research Board, All rights reserved.